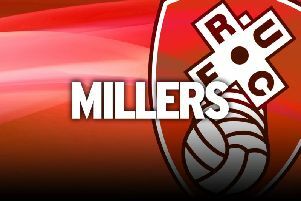 Rotherham United missed out on their big defensive target of the January transfer window because the selling club pulled the plug on the deal at the last minute, manager Paul Warne has revealed. The Millers believed young Coventry City centre-half Jordan Wilson would become their new record signing after they agreed to meet the League One outfit’s asking price. Warne expected to receive confirmation the move had gone through when he returned to the dressing room after Tuesday’s deadline-day defeat at Nottingham Forest only to find the Sky Blues had changed their mind. “They didn’t want to sell him, in the same way I didn’t sell to Wardy (striker Danny Ward),” the interim boss said. “That’s their best player. He is their captain, their shining light, so you can understand why they don’t want to sell him. There had been initial haggling over personal teams, but wages weren’t the stumbling block in the end, Warne said. Warne, who takes the Championship’s bottom side to Bristol City on Saturday, had also hoped to sign Grimsby Town hot-shot Omar Bogle in the final hours of the window after chasing the League Two star throughout January. “I thought we would have had two more bodies through,” he admitted. “We did everything that we could. We had two club-record bids in, so the chairman (Tony Stewart) fully backed what we wanted to do. They were good bids. “I think criticism of the chairman is unfair. He backed everything we did in this window. There have to be budgetary restrictions. We are not going to sign anyone on £80,000 per week. Rotherham last week offered terms to former trialist and free agent Ryan Taylor, who can play as a full-back or in midfield, but a move to South Yorkshire for the 32-year-old doesn’t appear likely. Meanwhile, the Millers are hoping central midfielder Tom Adeyemi’s illness won’t keep him out of the clash at Ashton Gate. Left-back Ben Purrington will be in the squad for the first time since joining from Plymouth on a three-and-a-half year deal. Deadline-day loan signing striker Carlton Morris should link up with the club next week after completing his rehabilitation from a hamstring injury with parent club Norwich City. Defenders Darnell Fisher and Aimen Belaid, who both pulled hamstrings last week against Barnsley, should be back in action in around 10 days, Warne predicted.